Heather Ahtone is the senior curator at the American Indian Cultural Center and Museum in downtown Oklahoma City. She is a proud citizen of the Chickasaw Nation and is of both Chickasaw and Choctaw descent. 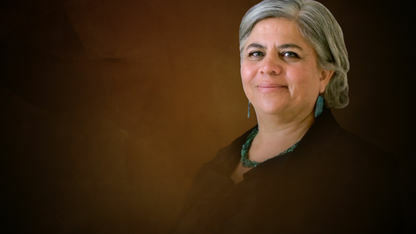 Ahtone completed her associate's degree at the Institute of American Indian Arts in 1993, and then went on to receive her master's from the University of Oklahoma in 2006. Ahtone curated independently and worked with the Institute of American Indian Arts Museum and the Southwestern Association of Indian Arts in Santa Fe, New Mexico. She also worked for Ralph Appelbaum Associates in New York. Ahtone began teaching at the University of Oklahoma in 2007, serving as an adjunct professor at the OU School of Art and Art History. Ahtone taught the course "American Indian Women in Art." Her research and writing has focused on placing contemporary and indigenous Native American art within the context of America's overall history and culture. Ahtone has curated art exhibits with historical Native American artifacts, focusing on documenting the evolution of tribal design and culture. Ahtone's goal has been to develop an interdisciplinary approach to studying indigenous Native American art. The Fred Jones Jr. Museum of Art named Ahtone the James T. Bialac Assistant Curator of Native American and Non-Western Art in 2012. She served for more than six years in this role and completed her doctoral degree in Interdisciplinary Studies at the University of Oklahoma. In March 2018, the American Indian Cultural Center Foundation appointed her as senior curator of the American Indian Cultural Center and Museum in Oklahoma City. Recognized in 2007 in Oklahoma Magazine's "40 Under 40"